2016-17, even though it was abbreviated by weather, was possibly my all-time favorite season. I began the season in better shape than ever, saw more birds than ever, enjoyed two fantastic dogs working beautifully together every single time we hunted, and spent much of the time in the field with my amazing wife and some very good friends and family. Here are some of the image-memories of this beautiful season, courtesy of Leslie and her gifted eye. 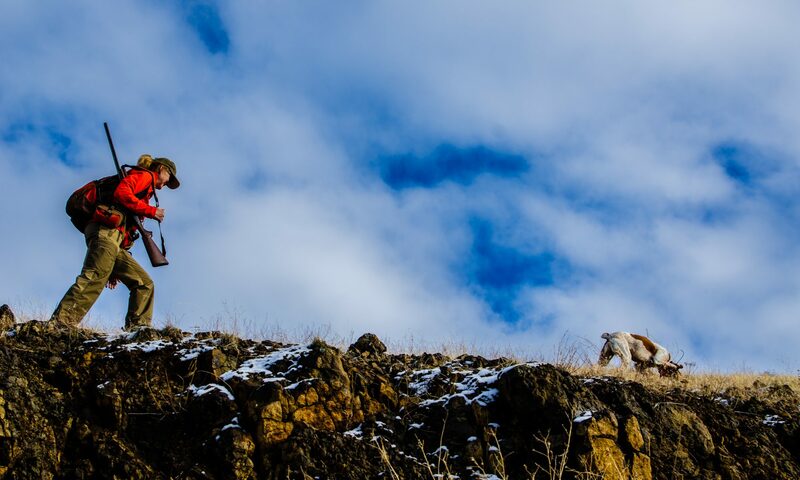 Her chukar hunting photos help me get through the off-season. Enjoy. Those are some fantastic pics Bob. Thanks! Very cool, thanks for sharing your hunts with us. Leslie’s wonderful photos will help me get through until next season as well! Though I have never met you; as I follow your year it seems I become a part of it. I appreciate all the events and great photos. I will miss following along. Thanks for the memories. You both be safe and healthy! Great selection of photos! Love the 5th shot, with the nearly vertical terrain. No cigarette butts up there! Thanks for sharing and let’s hope the snow melt across chukar country continues. Thanks for sharing Bob and Leslie – beautiful shots. Thanks Bob and Leslie, great partnership and photos with your Brits. Yes, it was a good season for me and Bobo (my French Brit). We have been coming in Oct/Nov all the way from Calgary, Alberta to hunt Hells Canyon and other places for the past 5 years. Let’s all stay in shape for next season! Great photos. Incredible memories. Good work and may our paths cross in the fall/winter. I was looking for hunting blogs and I found your site—I have to say, these photos are incredible! I particularly like the shot of you walking out into the mountains (the 9th one down)—it reminds me of that famous painting by Caspar David Friedrich, “Wanderer above the Sea of Fog.” It has the same visual layout—it’s an incredible shot. Thanks for sharing your photos, and—thanks for taking such good care of those dogs! They look truly happy! Marcus, thank you for the kind words, and for the reference to the Friedrich painting. I’m very curious about how you made that connection; I didn’t know that painting but see what you’re talking about, especially with the aspect of the head and its alignment with the horizon. I’m grateful for your thoughts, which are my reward for doing this blog. Thank you. You hunting was quite good.Thanks for sharing your sweet memory.